Click these links for information on joining NCSM, or renewing your membership. School-based administrators wear many hats as the primary instructional leader to the students, teachers, and community they serve. 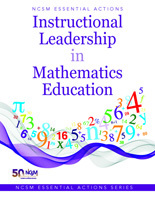 The latest book from NCSM in the Essential Action Series is a go-to resource for principals as they work toward increasing mathematics learning for each and every learner. 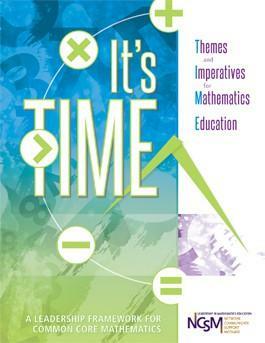 This hands-on resource details the essential actions for mathematics leadership. Mathematics coaching has been shown to be one of the most effective ways to increase teacher effectiveness and student learning. 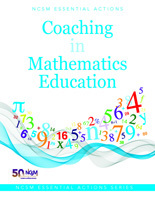 The book Coaching in Mathematics Education, from NCSM's new Essential Action Series, will serve as a guiding reference for coaches, teachers, administrators, and others as mathematics coaching programs become more prevalent throughout schools worldwide. Help all students become high-achieving mathematics learners. Gain a strong understanding of mathematics culture, and learn necessary best practices to fully align curriculum and instruction with the CCSS for mathematics. You'll explore the factors that have traditionally limited mathematics achievement for students and discover practical strategies for creating an environment that supports mathematics learning and instruction. 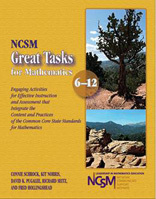 Schrock, C., Norris, K., Pugalee, D., Seitz R. and Hollingshead, F.
The "great tasks" are designed to provide opportunities for students to explore meaningful mathematics-to challenge their thinking about essential concepts and ideas. 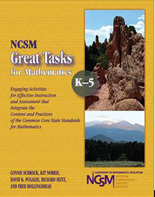 The tasks in this book provide unique contexts for promoting problem solving with each activity aligned to the Common Core content standards, including specific attention to the standards for mathematical practice. Each activity includes teacher notes and student explorations. The tasks are relevant, thought-provoking, teacher-tested explorations designed to promote mathematical reasoning and active student engagement necessary for students of the 21st century. 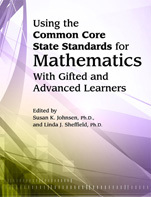 Using the Common Core Standards for Mathematics with Gifted and Advance Learners provides teachers and administrators examples and strategies to implement the Common Core State Standards (CCSS) with advanced learners at all stages of development in K-12 schools. The book describes-and demonstrates with specific examples from the CCSS-what effective differentiated activities look like for top learners. It shares how educators can provide rigor within the new standards to allow students to demonstrate higher level thinking, reasoning, problem solving, passion, and inventiveness in mathematics. By doing so, students will develop the skills, habits of mind, and attitudes toward learning needed to reach high levels of competency and creative production in mathematics fields. 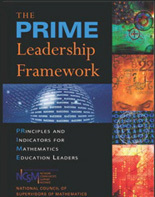 The PRIME Leadership Framework identifies the specific principles, indicators, knowledge and skills necessary to lead others beyond the current reality of student performance in mathematics into a focused, more equitable and successful future. The framework identifies the key leadership principles in four domains of mathematics education leadership: equity, teaching and learning, curriculum, and assessment. It goes on to identify three specific indicators of leadership in each domain. Each indicator is further broken down into specific actions that fall on a continuum of three stages of leadership growth: 1) knowing and modeling leadership, 2) collaborating and implementing structures for shared leadership on the local level; and 3) advocating and systematizing improvements into the wider educational community. The framework concludes with tools for reflection, self-evaluation, and discussion.